Those of you who run or bike in cold climates know this phenomenon. Even though it may be bitterly cold, we still work up a sweat. These sweatsicles tend to collect on earbuds cords, earrings, and hair. By the end of today's chilly 8-miler I had developed quite a sweatsicle, but mostly only on my left side. I have no explanation for the lack of symmetry. In the future I should make note of this...perhaps I am sweatier on one side than the other...? The dude in the photo at left is also exhibiting a substantial left-side sweatsicle. Perhaps I am not the only person afflicted by this strangeness. I think Urban Dictionary needs a new definition. It is apparent that the individual who submitted the existing one is a wuss, opting for gym when the weather is cold. REAL sweatsicles come from exercising OUTDOORS when it is COLD. Not throwing sweaty workout gear in the freezer. Any pansy can do that, heh. Sweatsicles are one of the many badges of being tougher than Mother Nature (and Old Man Winter). My friend and I had a nice run. 8 chilly miles. We both felt pretty tired, but it could be the cold wiping us out a bit. I felt really stiff for the first few miles and alternated between feeling overdressed and feeling chilled. I'm very ready for Spring. I notice that when it's especially cold my shoes feel hard and inflexible. Both of us found that our feet were really tired by the end of the run. 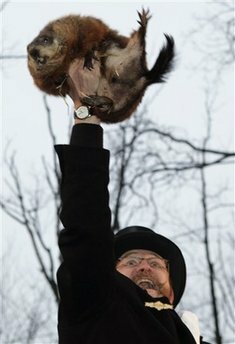 3 more days until Groundhog's Day. This means the end of Winter is in sight, regardless whether or not he sees his shadow (which requires sun. He rarely sees it around here). Until then I'll continue to pedal the "nowhere bike" and keep my Yaktrax next to the front door.